The following article explains how to voluntarily hand raise a baby finch in order to produce a hand-tame pet bird, as is often done with parrots. 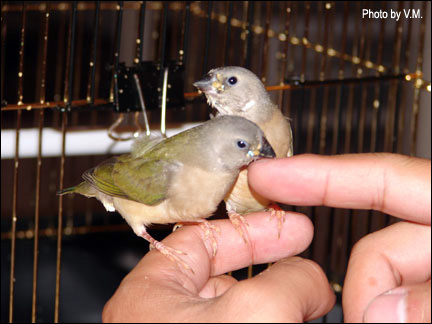 Please keep in mind that hand raising finches is a very time consuming commitment which may result in adult birds which have special needs. Like parrots, hand-raised finches must be allowed human interaction on a daily basis if they do not get along with other birds. Hand raising is often unsuccessful with very young chicks, and as such only those babies which have juvenile feathers covering their bodies should be considered as potential candidates for voluntary hand raising. Babies wich are naked, have only down feathers, or those which have only pin feathers are risky candidates and require additional care including a heated brooder, an increased feeding frequency, and hand feeding formula which is diluted to a specific consistency based on their age. The following guest article is NOT intended as a guide for rescuing very young abandoned babies; for information on hand feeding very young finches (as is often done in order to attempt saving their lives), please see FIC's official article on Handfeeding. No matter what age chick you are feeding, and regardless of the goal of hand raising (saving a life vs. creating a tame pet), following proper hygiene is a MUST in order to avoid making the baby sick. Before reading the following guest article, I highly recommend reviewing FIC's Handfeeding article to obtain additional background information on the subject of handfeeding. The views expressed in the following guest article are those of the author and do not necessarily reflect the views of the Finch Information Center or its creator. "My love for birds began at a young age. I was somehow never attracted to the parakeet, always the pointed beak of the finch. My first hand fed bird was actually a house sparrow. I was about 9 years old, playing in the parking lot while my older brother was fixing a friend�s car. Suddenly, out of the blue, this baby bird flew next to me and began opening his mouth, begging to be fed. He was not afraid as I pointed my finger to his open beak; rather he seemed to try to eat it. If you�ve ever had the chance to see wild birds abandoned by their parents, or just lost--they�ll beg food of other animals. Just recently I saw a young sparrow begging food from a rabbit in my backyard! That�s how I first started hand feeding finches, and my love for finches was cemented for life. I adopted the abandoned sparrow and the rest, as they say, is history. Today I have a wonderful Gouldian finch named Kiki. He is about a year old and extremely tame. Kiki is the main attraction at our house when people come over; they are amazed at how tame he is. "How can a bird so colorful and beautiful be so tame?" "What kind of bird is it?" Those are the questions I mostly get. The secret of course is that I hand fed Kiki since he was three weeks old. The task however is a main deterrent. The mere thought of the dedicated regiment is enough to stop people from considering doing it themselves. 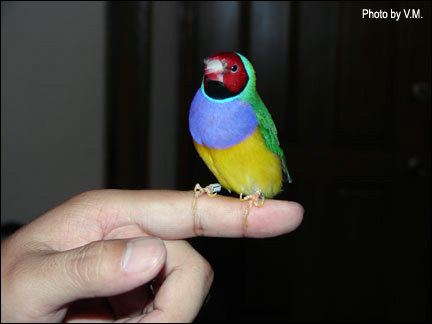 But, if you are ready for the task and rewards of having a tame Gouldian finch (or any other), read on! Before you undertake this task, please keep in mind I do not claim to be a finch expert. This is a technique that has worked for me, and my hope is that it will also work for you. Baby finch: I don�t recommend anything younger than 2 weeks, simply because you�d have to worry about finding the right syringe or tool to hand feed. You may also have to tend to them more frequently and watch them very carefully. I usually pull mine out at 3 weeks or at least wait until they have enough feathers to cover their bodies. Here�s a TIP to try at 2 or 3 weeks old: if you put your finger in the nest and the baby bird opens his beak (expecting to be fed) then he�s just perfect, and you�ll have an easy time to hand feed. However, if the bird keeps retracting (throws his little behind way in the air) and seems afraid of your finger...it means he can tell you are not a bird, but a big monster who might just eat him! Even at that stage you can take the bird out to hand feed, but you�ll have to force feed him until he is used to the syringe and you. Force feed means you have to gently pry his beak open, insert the syringe inside his mouth and feed him (because he won�t open his mouth -- at this age, they can tell the difference between you and their parents). Though after a day or two, he will realize you mean him no harm and freely open his beak when you approach for feeding time. That�s why I stress a baby about 2 to 3 weeks old. At that age, they only care about being fed and should freely open their mouths/beaks as you approach. It skips the force feeding step, as some may view it as cruel and unnecessary. A container: This is to house the baby finch. I use an old shoebox and perforate the cover. Inside the shoebox is a bowl lined with napkins. Placing the baby finch inside the shoebox should isolate him from any drafts and keep him warm and cozy. A syringe: This can be obtained at your local drug store. 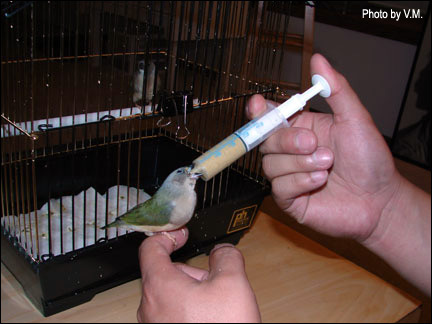 Pick the smallest syringe so that it can fit inside the finch�s beak (mouth). Kaytee Exact Hand Feeding Formula: This can also be found at your local pet shops for about $9.00. One canister should be able to last you through 1 or 2 birds. What time of day to remove and prepare the baby finch for hand feeding? I remove my babies in the morning, usually on a Saturday morning -- it gives me the weekend to watch the first two crucial days of his new life as a human pet. By 9 AM, the baby should have been fed by his parents, so it�s a good time to take the baby away for you as a pet. My birds are used to me, so they don�t mind if I check on their babies. They�ve never abandoned their chicks because of me looking inside their nest. As a matter of fact, the mother is one of the finches I handfed. She turned out to be a great mother, rearing her own children. To begin with, I highly recommend you try only with 1 chick. As you progress with experience, you may add more. I once hand fed 4 zebras and 1 Gouldian at the same time. Here�s how I do it. I fill about half a scoop of the hand feeding formula (there�s a blue scoop inside the hand feeding container), and slowly add warm water to it. I slowly stir it to make a nice "soupy" mix, and then I pour it into the syringe. I make sure it squirts a nice paste of mix, and there you go -- it�s ready for use. Approach the baby finch and make a sound (I whistle). What this does is condition the finch to your approach and feeding time. You see at this age, the baby finch is used to hearing his parents enter the nest (sound of wings flapping). He knows that it is feeding time when he hears the sound of wings flapping next to the entrance. You are now taking the role of the mother/father, but you don�t have wings. I whistle instead. So as you open the cover of the box and whistle, the baby finch will automatically open his mouth (by now it should be about 10 or 11 AM). Gently insert the tip of the syringe deep inside of his mouth, and [while he is begging] slowly squeeze the syringe to squirt some formula out. You may even hold the baby finch in the palm of your hand (this helps to imprint the finch on you even more). You�ll see his food sack [(crop)] expand and fill with the food formula. When [the crop reaches] the size of a small hazelnut, you can stop feeding. Or else stop when the baby won�t open his mouth anymore. He�s full. Give him a good praise and pet him gently, then place him back into the shoebox. You may choose to hold him longer in the palm of your hand to get him used to you. Continue this practice for the next 2 or 3 weeks. Feed every 3 to 4 hours. This is a critical stage as your baby finch may die if you do not care for him properly. Keep children and other household animals away from the baby. Keep him in a warm area in the winter if you are hand feeding during the winter months. At this stage the baby finch will be content just being fed and sleeping; thus there is no need spending a lot of time bonding. You may simply just feed and let him rest. They can�t stand at this age yet. By now the baby finch will be more active and alert. You may actually open the lid to find him outside of the bowl. You can now take him out of the shoebox and transfer him into a small cage. He should be able to stand on a perch now. Again keep feeding him every 4 hours. Because I work full time, we feed ours at 7:30 AM and end around 9:30 PM (or even 10:00 PM). Now you need to start to train your finch. At this age, he will chirp to be fed when he�s hungry every 3 or 4 hours. First Lesson: When you open the cage door, do not take him out. You need to teach him to come to you now. Therefore, open the cage and call to him. Because he�s still learning to fly, place your hand out about 1 inch away from the door. If he appears to be hesitating, hopping, and chirping around, taunt him with the syringe. By now he�ll know the syringe very well. The idea is to get him out of the cage and to you. If he hops out and onto your hand, you�ve successfully completed lesson 1. Keep at it until he comes, hunger ultimately wins, .and he will hop out and into your hand. Because they�ve not mastered landing yet, he may hop out and land somewhere else; it�s OK, and reward him with feeding. He still came out. Continue this for about 1 week, each time staying a bit further away from the door. You are teaching him to come to you and land; but always have your palm out. They are a bit clumsy still at this age, and need lots of landing space. After two weeks, he should now be able to fly fairly well. Now stand a few feet away from the cage, and call out to him (with cage door open obviously). Now however, don�t use your open hand, but use your finger (perpendicular to your chest). Place the syringe in his view, behind the finger. You are teaching your bird to fly to your finger. The joy of seeing this feathered thing flying to you is a great feeling--be warned--just like a puppy running to you as you call out his name. Continue this stage for 1 week, each day standing farther away from the cage. Now is truly the time to bond with him. Do some exercises with the bird. Between feeding time, call out to him by extending your finger. By now he should associate you calling to him and seeing your finger as "Oh, I need to fly there; I�m being called." You don�t need to have the syringe because you have conditioned him to come to you on command. Allow him to sit on your finger and gently pet and talk to him (as an adult, he will no longer like to be petted). Introducing him to his environment is a good idea. Walk around the house or apartment with him on your finger. I let my Gouldian out at least once a day; he is allowed to roam freely...we close the windows. Gouldians are not like Zebras. They don�t need to be constantly on the move. Ours has his favorite spot and will just sit there; though he loves company and will follow you from room to room. He loves to sit on my wife�s laptop screen and just watch her type away. Stage 3: At 7 weeks old (the weaning stage) -- 2 to 3 weeks. You will notice that by now the little blue dots on the side of his [gouldian] mouth are almost gone or not clearly visible compared to when he was 2 to 3 weeks old. The baby finch also can�t open his beak as wide as when he was younger. The beak also looks more rigid and hard. He�s ready to be switched to seeds [or pellets]. Teaching the bird to eat on his own: here�s a technique I�ve used on every single bird I�ve had. You will notice the baby finch is now pecking at things. It�s a natural instinct. He�ll start pecking at dark spots on the carpet, at your hair, anything he can grab. That�s a good sign he�s ready to eat on his own. Again, keeping at the 4 hour intervals, but rather than hand feeding him with the syringe -- first present him with a spray millet. Place him on the kitchen table for example, and start "pecking" at it with your finger. Of course the baby finch won�t care for the spray millet because you�ve conditioned him to see a syringe. He�ll keep "crying" for you to feed him and open his mouth. Keep pecking at the spray millet; even put it to his face. He�ll peck at it, but don�t expect him to eat just yet. The millet seed will feel different from the usual formula, and he will spit out the seed. That�s perfectly normal. You just have to keep pecking at it for a few minutes, and see what he does. Very rarely they�ll get it the first time; thus you will have to mix up some formula and hand feed the little booger. But at least he�s learned. Leave a spray millet with the bird and go on to other business. At the next feeding time, try the same procedure again (present millet and peck at it until you can�t bear to see him not eat). On the second day of this stage, however, hand feed him in the morning (for example) and place a spray millet with him, but wait longer to check on him. You should do this on a Saturday, so that you are free to check on the bird. This is the other critical stage, as the bird may potentially starve to death (wondering what�s going on with the new program?). Therefore check on the bird often to ensure he�s not starving to death. If the bird appears weak, sits at the bottom of the cage, eyes half closed...you�ve waited too long. Hand feed him immediately. However, if you check on him after 5 hours and he�s not chirping at your sight, it�s a good sign. Check the spray millet you left in his cage. To be sure [if he has eaten on his own], gently grab him and slowly blow around his neck area to expose his [crop]. If the [crop] is full of spray millet, congratulations! You now have a bird that�s able to eat on his own. That�s the importance of leaving a spray millet in the cage. Hunger will kick in, and he will start to look around the cage. Naturally, he�ll start to peck at the spray millet and eat. If you�ve ever watched your baby finches, the mother will simply refuse to feed them once they�ve reached a certain age. She�ll just eat to show them how to peck at the seeds. Your finger pecking at the spray millet taught them how to peck at it -- they learn by watching you. This entire process should take no more than 3 days, as they�ll quickly learn to eat on their own. You may continue to choose to feed the bird every four hours, letting him eat the millet out of your hand, or simply leave him the food. However, continue the exercises. You may switch to regular seeds [or pellets] after about 2 to 3 weeks. Still provide the millet, but also include a dish of seeds [and/or pellets]. Eventually, the millet will become just a treat, and the seeds [or pellets] his regular diet. You should still continue to do exercises with your finch. Place him on a chair and stand across the room. Extend your finger and call out to him. Again, he should fly to you because you�ve conditioned him. Now is the time to teach him to come out once a day, or whenever you are free to spend time with him. Open the cage, but always call him to you first. Then let him roam free. Again, you are telling him (or making him think), "Oh I fly to him first, then I get to roam." I call out mine first to my finger, then greet him and talk to him. If he�s a male like ours, he will start dancing and hopping on my finger. Then we let him roam free; though he will normally fly back to my shoulder. Soon you won�t have to call him, he will just fly to you for attention. That�s the ultimate stage you want to attain. He�s so tame then that he doesn�t need to be "commanded" to come to you. He�ll do it freely, and rightfully so. You are no longer the master, but the friend or caretaker. Nine weeks to get to this level; but when it gets to this level -- you will realize the beauty of your relationship with your feathered friend. If you�ve arrived at this stage, congratulations! Seed in flight trick - Here�s a fun trick I�ve taught my birds. At feeding time, hold a seed between your index finger and thumb; then hand it to your finch. He will cheerfully take it and eat it. Now take a second seed, but this time hold above his head. He should be looking up, reach it, and eat it. Good. Now, do the same but a bit higher. He will extend his body, reach up higher, and eat it. Great. Now do the same but even a bit higher. Now he really has to reach up higher, almost on his "toes" to grab it and eat it. Perfect. Now do the same, but hold it much higher. The bird will jump up to grab the seed out of your hand. Continue this, but hold your hand out higher and higher. He�ll have to flap his wings to lift himself up in order to grab the seed. Eventually, I�ve stood across the room with a seed between my index and thumb. The bird will fly across the room, grab the seed, and fly back to his perch -- never ever touching ground. Most impressive, from across the room! I�ve trained a zebra and Gouldian to do that, and have the video somewhere. Give it a try, but patience is key! Drinking out of hamster water bottle - I like my finches to drink our of a hamster water bottle, because you don�t have to worry about droppings getting into the water. How do you teach your bird? Here�s how I do it (it works with birds not tame as well). All I do is actually grab the bird, and push his beak into the ball to release the water. The bird will be surprised as water runs down his beak, but he will get a taste of the water. They�ve always remembered to push on the ball after that to get water. As a precaution, still include a regular water dish until you actually see your bird drink out of the hamster water bottle. Once you see that, you can be certain other birds will follow, pretty soon you�ll have all the birds drinking like that. Again, it�s my preference and it has worked for me. I hope this guideline was helpful to some of you. My first attempt to get a baby finch to hand feed was met with "Hand feed a what? A finch? You can�t do it, that�s not possible." These people could only see in their minds the picture of a hand fed parakeet or lovebird. My hope is to see hand fed finches at your local pet store, among the parakeets and lovebirds. What I wrote here is from my own experience and observations. If it worked for me, surely I don�t see why it wouldn�t work for you. If you are reading this, I can only conclude we share the same love and interest for finches. My way may not be the right or only way. But it may be the start for you to find your own way. Best of luck, and be sure to share your pictures with us! Whatever happened to my house sparrow? It was a wild bird, and he was released with great sadness. He came back, but eventually he realized he was meant to be in the wild."